Did you know that a master’s in management can increase your long-term earning potential? Attend an information session at UCSD to learn more about the University of Virginia’s M.S. in Commerce, a one year management degree for non-business majors. UC San Diego’s annual innovation conference for risk-takers, rule-breakers and changemakers. UC San Diego students can register for free by using code IGNITEUCSD during online registration at ignite.ucsd.edu. How will you impact the world? Want help with writing? Look no further than the Writing Hub workshops! These will give you quick, memorable strategies to help you with some of the most common writing struggles. Wednesdays, 5:15-6:30pm, Teaching + Learning Commons. Upcoming workshops: Week 7 – How to Paraphrase Effectively & Week 9 – 3 Easy Ways to Improve Your Writing. Writing Retreats consist of five 4-hour sessions dedicated to individual writing time plus workshops for more positive writing habits. With other graduate students, you will make progress on your writing project and develop practices and mindsets that make writing enjoyable. There is still time to sign up, we have a few spots left! SASE at UC San Diego is hosting their annual Dining with Professionals (DWP) event on February 9th, 2019! Dining with Professionals is an amazing opportunity where students can come dine with professionals and learn more about their career passions. Delve into the mind of an actual professional with a personal backstory. Last month, we commemorated the life of our dear friend and colleague, Jeff Elman, with a memorial service at UC San Diego. Many of you participated and many others expressed their support from afar. To honor his legacy, an extraordinary prize has been created in Jeff’s name. Read more about Jeff Elman's celebration of life and legacy. Interaxon is hosting a graduate student panel on the graduate application process, experiences in the field, and neuroscience careers and opportunities Thursday, January 17th, in the Dolores Huerta Room at 7pm! Join us for an evening of light refreshments, discussions on graduate school, and updates on Interaxon’s upcoming volunteering and presentation opportunities! The International Institute and Human Rights Program are pleased to announce the 12th annual student competition for human rights fellowships. Successful applicants for the 2019 UC Human Rights Fellowship will receive $5,000 for summer internships with a human rights organization of their choice. December 10 is the priority application deadline for UCSF's Master of Science in Global Health program! Learn about the program at an info session on December 4th, 2018. Register to attend in person or online! Learn how to use data to make wise actionable data driven decisions! Qualcomm Institute’s series of day camps provide participants with practical, hands-on learning experiences. The next Day Camp is a two-day hands-on workshop on January 17-18 on IoT Tools & Techniques. Instructed by Dr. Natasha Balac. The Design Forward Alliance, a regional partner with the UC San Diego Design Lab, is hosting a Half-day Miniconference titled Business Camp: Design on Friday, November 2. This is a special half-day miniconference specifically for non-designers: business people, product leaders, entrepreneurs, educators, and civil servants. Join us for an afternoon of learning, inspiration, and connection with fellow professionals. The Library has some upcoming half-day data analysis workshops: Introduction to R (Tuesday, 11/6), Data Wrangling in R (Wednesday, 11/7), and Data visualization in R (Thursday, 11/8). Registration is required and they are filling up quickly! The Library hopes to have these workshops each quarter, so those who are waitlisted will have priority for next quarter. Leon Sanchez Reyes is being featured for his hard-working journey through college, supporting his family after his parents were deported two weeks before starting at UC San Diego. He graduated in June with a B.S. specialization in Human Cognition. Congratulations, Leon! Lera Boroditsky on NPR's "Hidden Brain"
An episode of NPR’s “Hidden Brain” podcast features an interview with Associate Professor Lera Boroditsky. She discusses studies she and other researchers have done that show language can shape people’s ideas about time, agency, and gender. The UC San Diego Library in collaboration with the Health Sciences Research Service Core will be offering a free Publications training session on August 22, 2018. The goal is to inform academics who publish articles related to NIH (or other funders with a public access policy) grants about tools and resources for compliance with the NIH public access policy. Grad Students: Got a Summer Writing Project? It is with great and wrenching sadness that we announce the passing of Distinguished Professor of Cognitive Science Jeffrey L. Elman, who died suddenly on Thursday, June 28. He was 70. A campus-wide Celebration of Life memorial will take place in the Fall -- details to come. Register on Eventbrite for "Maps to the Future: Planning Careers in the 21st Century." The event will be held Saturday, July 21, 1pm-6pm. Apply to participate in MedHacks, the nation’s premier medical hackathon, taking place at the Johns Hopkins University on September 7-9th. Also take the opportunity to apply for a travel reimbursement by July 20th. Come attend the Graduate 2nd & 3rd Year Presentations next week in CSB 003. The 3rd year presentations will be on Monday, June 11 8:45am-1:40pm and the 2nd year presentations will be on Tuesday, June 12 8:45am-1pm. Please join us for the 2018 CogSci Undergraduate Honors Thesis Presentations, Thursday, June 14th from 9am – 1:30pm in CSB 003. Check out the Visual Communication & Social Issues Workshop on May 31 in the Thurgood Marshall College Room (Price Center 2nd floor). Hear from Joshua Henry and Amiel Capinpin as they discuss media’s power in propelling social issues. XR On the Bay is a conference held on June 25-27 exploring “the tech of Hollywood”, including AR, VR, AI, Post Production technologies, Blockchain, Cloud Services and more. More than any conference before, this is the event where Silicon Valley meets Hollywood. Lawrence Livermore National Laboratory (LLNL) and UC National Laboratories (UCNL) are jointly hosting a Data Science Workshop, to be held in Livermore, CA on August 7-8, 2018. The workshop will feature a wide range of talks, discussions, and networking opportunities with experts, researchers and up-and-coming scientists in the field of data science. Abstracts are due June 1, should be no more than 500 words and include a title and list of all authors with their institutional affiliations. Workshop attendance is limited, so register early (even if the attendee doesn’t plan to submit an abstract). Christopher Keown to defend June 4, 2018 at 10am, CSB 003 on "Genome-Scale Studies of Dynamic DNA Methylation in Mammalian Brain Cells." Be sure to register to attend Triton Entrepreneur Night on Thursday, May 31, 6:00 PM - 8:30 PM at Price Center West Ballroom. Adam Rule to defend June 6, 2018 at 3pm, CSB 180 on "Design and Use of Computational Notebooks." Design at UCSD is bringing to you Design Frontiers: Healthcare, a day-long design sprint and lightning talks on May 20 at 10am in the Qualcomm Room, Jacobs School of Engineering, featuring speakers from Illumina focusing on applying human-centered design to the field of healthcare. This is an effort to increase cross collaboration of students across multiple disciplines, and show UC San Diego students through hands-on experience how design thinking can be applied to topics beyond product and UX/UI design. This event will be very hands-on and expose students to real design work. Dr. Chris Johnson’s Nat talk on "The Mind of the Dolphin"
Dr. Chris Johnson will be discussing research on the minds of dolphins in a public talk on Tuesday, May 15th @ 7pm at the Natural History Museum in Balboa Park. Tickets are $9 for members and $12 for non-members. The UC San Diego Arthur C. Clark center for Human Imagination interviewed Dr. Chris Johnson and her Visual Arts graduate student, Lisa Korpos, about their joint efforts to “interpret” dolphin communication for their podcast (Episode 16: Alien Contact: Part 2). On Saturday, April 21, 2018, Cognitive Science student Andrew Washington (along with mechanical engineering students Roland Ho and Bicky Lenh) discovered a disoriented elderly woman very close to the canyon rim on the north side of EBU 1. Had Andrew not stayed with the woman, Patrol Sergeant Scott Gustafson believes she may have wandered into the canyon where she could have been injured or further lost in the brush. The Cognitive Science Department would like to recognize Andrew for his outstanding actions and show of compassion that may have saved this woman’s life. UC San Diego’s Institute of Public Health (IPH) and Design Lab invite you to an event: The Future of Public Health Research: Building Capacity for Precise, Networked, and Agile, Sociotechnical Systems through Design, Engineering, and Health Sciences. Register on Eventbrite for the event held on May 17 8:00a-1:00p at Atkinson Hall Auditorium. Department Chair Marta Kutas was elected as one of three UC San Diego professors to an honorary organization, the American Academy of Arts and Sciences. Register for the UCSD Community Psychiatry Program held on Sunday, May 20th at the Jo and Vi Jacobs Center for the 2nd Annual Mental Health Career Fair and Educational Day! The conference will include a complementary luncheon with special table presentations, opportunities to meet with community leaders, panel workshops featuring experts in the field, as well as the chance to learn about the various mental health disciplines and the education process involved. Join the Department of Literature’s annual writing competitions, open to all UCSD undergraduates: the Stewart Prize in Poetry ($300 prize) and the Dr. Milton H. Saier, Sr. Memorial Award in Fiction ($1,000 prize). You may submit up to 5 poems for the Stewart Prize (but your entry will be judged as a collection, not separate pieces) and one piece of fiction (15 pages max) for the Saier Award. Submission guidelines are included on the entry forms, which are available in the Literature Undergraduate Office (Lit Bldg, Room 110). Deadline to submit is April 30 at 4pm. Are you interested in learning MATLAB or polishing your skills? Sign up for the MATLAB Training/Competition held at the Qualcomm Conference Center in Jacobs Hall, April 22 at 11am – 1:30pm. Free food will be provided. Before the event: please create a free MathWorks.com account, bring a laptop that can connect to Wifi, download and install MATLAB R2017b on your device. Check out this quarter's Design@Large talks, held Wednesdays from 4-5pm in CSE 1202. Now hiring new grad hardware engineers for the Carlsbad, CA office. Join us to meet the engineering team, learn more about the roles and submit your resume on April 3, 1:00-3:30 PM at Jacobs Hall - Lobby. Naomi Lin (Cognitive & Behavioral Neuroscience, B.S.) has been awarded with a 2018 UC San Diego Integrity Award for making outstanding contributions in support of UC San Diego's commitment to integrity. She will be recognized at the awards ceremony on Wednesday, April 18 from 5:30-7:30 p.m. in the Student Services Center, Multi-Purpose Room. If you plan to attend, please RSVP by 9:00a.m. Wednesday, April 11. In an effort to engage with brilliant minds at UCSD engineering students, ASML is giving out Padres baseball game tickets to 300 students. If you are interested in learning how ASML's chipmaking systems can control positioning to the nanometer and temperature to the millikelvin, while at the same time with modules accelerate faster than a fighter jet at takeoff, sign up for the ASML Tech Talk on April 4 at 6-8pm (Jacobs Hall - Qualcomm Conference Center) and get 2 Padres game tickets for April 13th. Tickets will be given at the end of the Tech Talk on April 4th. Each student will receive two tickets so you can take your buddy to the game! NSF’s Vizzies Challenge, now in its 16th year, invites researchers and members of the general public to submit their best science or engineering visualization. This year’s Vizzies closes on April 15th and entries may be submitted by individuals or by teams by visiting www.nsf.gov/Vizzies. NSF and PopSci.com will feature the winning entries on their respective websites. In addition, up to 5 Experts’ Choice winning entries will receive $2,000 each, and up to 3 People’s Choice winning entries will receive $500 each. The International Institute, the Center for Iberian and Latin American Studies, and the Department of Anthropology invite you to a workshop to help guide you through the difficult process of applying for an IRB/Human Subject applications. The workshop will be held on Friday March 16th from 12-2pm in the Deutz Conference Room in the Institute of the Americas. Come see the Winter 2018 Interaction Design Final Show on Friday March 16 at 4:30-7pm in the Multipurpose Room located in the Student Services Center! Join teams of high school, undergraduate, and graduate students to define, prototype, and pitch multidisciplinary solutions for contemporary border issues to a panel of CEOs, educators, and city officials on April 14 and April 21 for a chance to win $15k of prizes! The Department of Cognitive Science is pleased to award 6 scholarships of $1,000 each to students who will participate in study abroad programs, including but not limited to EAP, OAP, and Global Seminars in Summer 2018 and Fall 2018. The Cognitive Science Study Abroad Scholarship is open to all Cognitive Science majors. Applications are due April 2 at 2pm. Come hear Conor Frye's defense on Monday, March 12, 2018 at 9:00am at CSB 003. 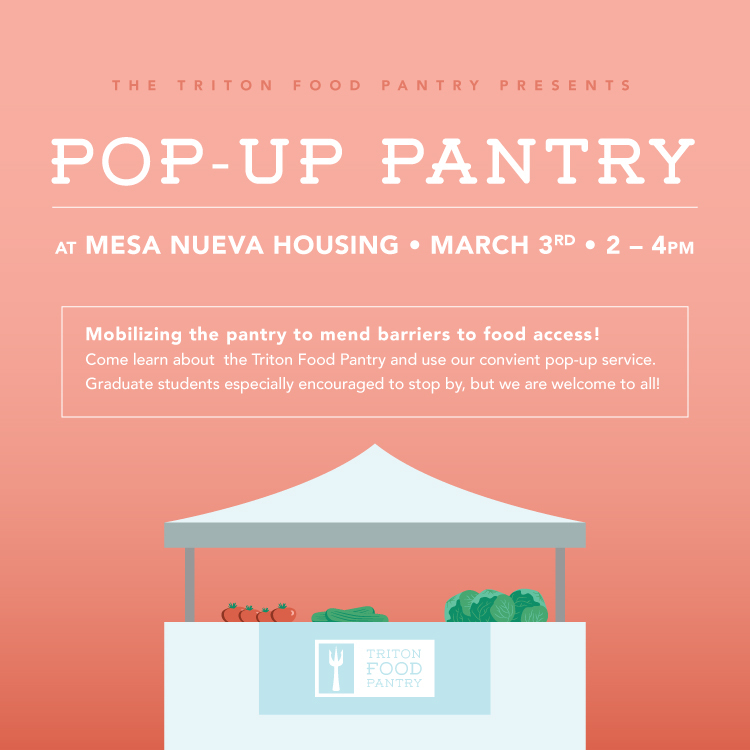 The Triton Food Pantry is excited to bring a Pop-Up Pantry to Mesa Nueva on Saturday, March 3 from 2-4pm. The Pop-Up Pantry is a need-based service providing fresh produce and dry goods for any UCSD student experiencing food insecurity. Each food item at the Pantry and Pop-Up Pantry has a point value, and you can select any of the items available for a total of 10 points. Please bring your UCSD student id and if possible a grocery bag to store your food. The UC San Diego Global Health Institute will be awarding up to $2000/person to support degree-seeking UC San Diego undergraduate, graduate, EAP, & professional students who plan to participate in a GLOBAL HEALTH RELATED field experience program. The application due date is March 31, 2018. Interested in pursuing a career in industry? The BioTechathalon is a case-consulting competition where teams of 4-6 people collaborate to develop solutions to a real-world problem, which will be presented by the biotechnology company featured in this year's competition. Because interdisciplinary approaches will be required to solve the problem, students from all fields of study are invited to participate. Come and network with innovative students, biotech company representatives, and esteemed faculty. All majors are welcome! Competition will take place April 7-8 and registration closes on March 11. Attend an informational session on March 2 from 3:30-4:30pm in Bonner Hall Rm 2130 to learn more. Design at UCSD is bringing to you Design Frontiers: Education, a day-long design sprint and lightning talks on March 10th at Qualcomm Room, Jacobs Hall, focusing on applying human-centered design to the field of education. This is an effort to increase cross collaboration of students across multiple disciplines, and show UC San Diego students through hands-on experience how design thinking can be applied to topics beyond product and UX/UI design. Western Digital invites Master and PhD students to come visit them on March 6, 2018 at the Qualcomm Conference Center, Jacobs Hall between 11am – 2pm. Please sign up using the Google form link. Selected students from this Google form will be sent a separate invite to attend this event. Please bring your most updated resume when you come to the event. This CSULB Conference is a great opportunity to learn more about the CSULB MSHF program and for those interested in topics such as human factors, psychology, human-computer interaction, user interface design, systems engineering, or human performance. The event will be held at CSULB on Saturday, March 10th. Registration is free and can be completed via their website. This year’s conference will include keynote speakers, a speaker break-out session, a poster session, an alumni panel, and free lunch. Registration for poster presentations is also free and open to everyone. The Department of Music at UC San Diego is organizing Sonic Fluidities, an interdisciplinary sound studies conference, on March 2-3, 2018 at Conrad Prebys Music Center. It will feature keynotes by George Lewis (Columbia University) and Clara Latham, as well as papers, performances, and installations by over 30 presenters from around the world. Please visit the website for the schedule and abstracts. All events are free of charge. Register for upcoming innovation and entrepreneurial programs held by The Basement! The Marikana Massacre: how could it have happened in Post-Apartheid South Africa? In celebration of Black History Month, the UC San Diego Department of Cognitive Science is pleased to announce a talk from Provost Ivan Evans on Thursday, February 22nd from 12 to 1 p.m. in Cognitive Science Building – room 003. Food will be served to the first 60 guests at this lunch seminar. Parsing Science speaks with UC San Diego's Rafael Núñez about his research into if human understanding of number has developed through biological evolution, or through the evolution of language and culture. UC San Diego's Design Lab Director Don Norman writes about how poorly designed software spread panic in Hawaii and offers tips for avoiding such incidents in the future. Come to SDSU's Philosophy and Representation Annual Student-Run Conference featuring keynote addresses by Dr. Nick Riggle and Dr. Tyler Burge on Saturday, April 7, 9:00am - 5:00pm at Storm Hall. This conference aims to bring several dynamic learning communities together for an enriching meeting of the minds, stimulating research, and an opportunity to participate in a connection along philosophical lines in our interdisciplinary inquiries. Social Cognition and Drugs in Australia - Global Seminar Info Session. Come meet Professor Jaime Pineda, and learn about the program courses, excursions, funding options and the application process! Monday, Jan 22, 5:00pm - 6:30pm in CSB 180. After returning from a hectic week of conferences, CogSci PhD candidate Tom Donoghue reflects on learning in graduate school, the work of science, and science as a process. UC San Diego researchers, including Eran Mukamel of Cognitive Science, will participate in the project led by Salk to identify cell types in the mammalian brain. The project is funded by the National Institutes of Health as part of the federal BRAIN Initiative. Does Cognitive Science (still) exist? Professor Rafael Nunez will be speaking about the past, present, and future of Cognitive Science at the Science Studies Colloquium Series. October 30th | 4:00 - 5:30 p.m. | HSS 3027. In September the department welcomed new graduate students and faculty to our CogSci community. Check out the photo gallery! Take COGS courses this summer in Sydney, Australia with Professor Pineda through the UC San Diego Global Seminar program! COGS 171: Mirror Neurons and Social Cognition & COGS 174: Drugs - Brain, Mind, and Culture will be offered. Learn more at info sessions held Nov. 13th 5-6:30 p.m. and Nov. 16th 3-4:30 p.m. in CSB 180. Info Session: 10/19/17 | 6-7:30 PM| Qualcomm Conference Center - Jacobs Hall | Be a part of the Summer 2018 Engineering Internship Program! Meet Mitchell Engineers to learn more. Advance your coding skill and gain hands-on experience. Learn Agile development techniques and be a true Scrum Team member! October 30th | 12:30-1:30 p.m. | CSB 003 | A talk by Cognitive Science Professor, Dr. Bradley Voytek. Prof. Voytek shows how zombism can be understood via modern neuroscience. Free lunch provided to the first 60 guests! Come join The Guardian, the official home of student journalism at UCSD. The Guardian has served thousands of readers biweekly via print and online for over fifty years. Recruitment event on Thursday, 10/12, at 6:30 p.m. at the Guardian office (located on the second floor of the Old Student Center). Come for free pizza, people, and plenty of paper. Qualcomm Institute's gallery@calit2 at UC San Diego features this exhibit on dolphin communication, open weekdays from October 5 through December 9th, 12-5pm in Atkinson Hall -- admission is free! Rose's PLOS blog entry discusses ComSciCon. She organized the flagship workshop in 2013 and its involvement has grown rapidly from there. “Publishing in scientific journals has long been a linchpin of success in science. But many scientists want their work to enrich the lives of the public and positively influence society". "You might have encountered Bradley Voytek through his writings and fan-convention talks about the brains of zombies, or through his more serious day job as assistant professor of computational cognitive science and neuroscience at the University of California, San Diego. But some know Voytek because he’s open about just how hard it was to get to where he is now." IBM awarded $10 million to Virginia de Sa and co-PIs in the Computer Science Department with co-investigators Marta Kutas, Andrea Chiba, Federico Rossano and David Kirsh from CogSci and others from CSE, to find better ways to prevent the symptoms of aging and allow individuals live in their homes independently for longer. The new Undergraduate Data Science major and minor will be launching this fall quarter! If you would like more information about the program, there will be a Town Hall meeting on Tuesday, September 26th at 2 p.m. in EBU3B 1202 to learn more. Calling all entrepreneurs, designers, engineers and problem solvers! In a combined effort to solve complex city problems through design thinking and crowdsourcing, the UC San Diego Design Lab has launched a city-wide civic design challenge called Design for San Diego (D4SD) with support from the City of San Diego, the National Science Foundation, the Design Forward Alliance, and SCALE San Diego. Professors Jim Hollan, Scott Klemmer, Philip Guo, and Bradley Voytek are co-PIs on an NSF-funded project to develop new data-science teaching curriculum for graduate students. In her latest blog post, PhD Candidate Rose Hendricks reflects on her experience teaching COGS 14A. CogSci faculty member Eran Mukamel and graduate student Christopher Keown published a paper in Science this summer on newfound types of methylation in single neuronal cells. Theoretical neuroscientist, technologist and entrepreneur Dr. Vivienne Ming looks to artificial intelligence and neuroprosthetics to augment humans. In recognition of her accomplishments in research, teaching, and mentoring as well as leadership at UC San Diego and in the global community, our chair Marta Kutas has been appointed the Chancellor's Associates Endowed Chair. Congrats! Interested in learning Spanish online this summer? Study participants needed. Are you interested in learning Spanish online this summer? Participate in this research study hosted by Stanford! Compensation is offered. We are excited for another year of welcoming over 2,000 new international students this fall! We would like to extend an invitation to any students who would like to volunteer. In return, the International Students & Programs Office (ISPO) would love to outfit you with an exclusive, limited-edition ISPO Orientation T-shirt, grant you access to our fun welcome activities, and get you fed at every event! In this issue of Trends in Cognitive Sciences, Núñez critically evaluates the idea that humans have an evolved capacity to represent number and perform arithmetic. He marshals evidence from non-industrialized nations and calls for a clearer distinction in the field between quantical and numerical cognition. Nieder and Núñez exchange letters further debating these ideas. Cover image from iStockphoto/Mike_Kiev. Cover design by Rebecca Schwarzlose. The University of Chicago is now accepting applications for our Discover UChicago program, an expenses-paid visit weekend to be held October 26-28, 2017 for candidates traditionally underrepresented in their fields planning to apply to graduate school in the fall of 2017 for matriculation in the fall of 2018. This exciting event combines workshops on applying to graduate school, individual meetings with faculty, and opportunities to connect with current UChicago students, as well as to explore our community and the city of Chicago. Come learn what it takes to be part of the Honors Program in the Cognitive Science department! Check out a unique career path you can take with a Cognitive Science Degree! Next week, UCSD CogSci Alum Gina Bello will be talking about her journey to becoming an occupational therapist and can answer any questions you may have! Join us on Thursday, June 15th from 11 a.m. - 1 p.m. for the 2017 CogSci Honors Student presentations! The Academic Enrichment Programs (AEP) is hosting a one-day Community College Symposium on Friday, May 19th (8am-4:30pm @ UC San Diego Qualcomm Institute). The purpose of the symposium is to expose community college students to the diverse areas of research in all departments at UC San Diego. Students from Community Colleges in the San Diego area will attend. The day will include research talks by faculty members and students, poster session by students, roundtable discussions, and tours. We are currently seeking volunteers for this exciting event. How do other animals think? Can they lie? Do they mourn their dead? What does this tell us about ourselves? Come find out! The last divide between humans and other animals is in the area of cognition. A comparative perspective to explore recent radical reinterpretations of the cognitive abilities of different primate species, including humans and their implications for the construction of evolutionary scenarios. Prerequisites: upper-division standing. Join us for an exciting afternoon with FREE LUNCH! The UCSD Career Fair and Educational Day will promote careers in the mental health field. The fair will provide a supportive experience for students of all backgrounds to gain a better understanding of mental health careers, education paths, and resources available to them. In this op-ed, our very own Cognitive Science Ph.D. student Rose Hendricks explains how the way we talk about climate change affects what people think about it. Christina Gremel, Assistant Professor of Psychology at UC San Diego will be discussing her research on habit formation and addiction. The 2017 Conference for Research in the Arts, Social Sciences and Humanities (CRASSH) is taking place on Friday, March 17 at the Institute of the Americas from 9 a.m. - 3 p.m. This conference showcases student research and creativity in the Arts, Social Sciences and Humanities through poster presentations, art displays, and artistic performances. The UCSD Design Lab and Contextual Robotics Institute are looking for undergraduates to join us in San Diego in Summer 2017 to conduct novel research at the intersection of design, cognitive science, robotics, and computer science. Our conference provides community-college, university, post-bac students and pre-health advisors with the information and skills necessary to succeed in the health-professions school admission process. It provides a unique opportunity for direct contact with deans of admission, admission officers, financial aid officers, faculty, and staff from a wide variety of health professional programs. This year, we will host 4,500 attendees. Join us this spring to learn about CogSci blogging! Any questions can be directed to Rose Hendricks [rhendric@ucsd.edu]. This year on Sunday, April 9th, the Cognitive Science Student Association will be hosting its Annual Cognitive Science Conference at PC Ballroom East starting from 10 a.m. The theme is Cognition@Work and will highlight the inner mechanisms of the brain along with the practical applications of Cognitive Science in the workplace. Our Keynote speaker is our very own Don Norman! Guest Speaker is Nate Bolt of ethnio! Join Intuit for a panel discussion with a few of our university recruiters and recent grads. Learn tips for interviews, offer negotiation, and communication with employers. Do you believe that computation and computing is critical for everyone in the 21st century? Do you want to help others learn, not only how to program, but how to think logically, debug technical situations, and create video games in a simple programming language? If so, this class is for you! Teradata is hosting a tech talk and pre-hack tutorial on Monday, February 27th 6-8 p.m. in the Qualcomm Conference Center. There will be pizza! The Artificial Intelligence and Cognitive Services Hackathon sponsored by Teradata will be held from March 3rd-5th, 2017 in the CSE building. The University of California has a released a website with information on immigration and resources relevant to the Executive Order. Intel is coming to UC San Diego with a new workshop on Deep Learning. Join us for dinner, learning, giveaways and prizes for all attendees! The Design Lab will be hosting a Studio Session featuring Helena Mentis, Ph.D. on Tuesday 2/7. She will be speaking on the topic of Crafting the Image in Surgery. We invite you to attend the session at the Design Lab, Atkinson Hall 1601, from 12:30 p.m. - 2 p.m.
Space is limited, please arrive early to guarantee a seat. Interested in studying the computational sciences at UC San Diego? Find out how you can research the major that best matches your interests, aptitude, and career aspiration. Are you a Warren student? Are you currently involved or interested in undergraduate research? Join The Equilibrium’s editorial team today! Funded by the Warren Provost’s office, The Equilibrium team annually reviews, edits, and publishes research conducted by Warren undergraduates in all fields of study. We’re looking for passionate individuals to be the next student editors, design editors, and public relations officers. To learn more about our available positions and the application process, contact us! Deadline: Friday February 3rd, 11:59 p.m.
Come to a lunch seminar hosted by the UCSD Department of Cognitive Science, we will recognize and celebrate the contributions of Black researchers by speaking about the work of three amazing scientists and discussing the importance of a diversity of perspective in research. Amazon will be onsite Wednesday February 1st2017 to hold an in person assessment for their Summer 2017 Internship Program! If you have not been invited to participate yet, and your graduation date falls between December 2017 and June 2018 please reach out directly to the Amazon recruiter Leo Pichette at leop@amazon.com. Want to find out what IBM Research is all about? Come chat with Rachel Ostrand, a 2016 PhD graduate of UCSD Cognitive Science and current IBM Research employee. Are you a student innovator? Are you a part of the San Diego innovation community? Do you work at a startup or an incubator? Are you a software engineer? Can you translate tough ideas into a pitch? Here’s your chance for your team to compete for prizes ($5K in cash awards) while solving the top issues facing our nation. Judges represent the top companies in innovation, technology and bio-tech within the San Diego community. Booz Allen Hamilton is hosting a two-day Cyber & Bio-Tech Hack-A-Thon in San Diego where YOU can compete, participate, and network with top industry leaders in both cybersecurity and biotechnology fields. Bring your laptop and ideas, we’ll host the food and fun! #WhatIF you were given a platform to share your story, influence, and inspire colleagues around the world to develop different ideas, driven by purpose, and fueled by passion. Take part in a celebration of people, purpose, and passion by attending Ideas Festival 2017, hosted by Booz Allen Hamilton. Here’s your chance to share your out of the box ideas with thought leaders and influencers in the fields of cybersecurity and biotechnology. Share your inspirations and ideas. Enjoy interactive panel discussions and learn from the innovation community within San Diego. Booz Allen Hamilton is hosting a two-day FREE Ideas Festival where YOU can participate in interactive demos and activities while networking with top industry and business leaders in San Diego. Wednesdays 4 p.m. - 5:15 p.m.
A​re you back into the swing of things after break​? Join Intel for Taco Tuesday! Taco Tuesday – Intel’s new technology and tacos; could there be a better match? Looking for a class to take Winter 2017? Sign up for COGS 118D: Mathematical Statistics for Behavioral Data Analysis. The UCSD Biomedical Engineering Society invites you to join the BMES Lab Expo on Friday, January 20th 2017, 10AM-5PM in the Price Center Ballroom, East. The Psychology Department at the University of South Florida is recruiting students for its PhD program this year. There are three areas, but this is on behalf of the Cognitive Neuroscience group of researchers in the experimental psychology area (called Cognitive, Neuroscience & Social-- CNS). Are you interested in a career in BlueTech? Come check out Link2BlueTech - where students like you are introduced to a panel of industry experts and given the opportunity to network and hear about exciting job opportunities within San Diego's BlueTech sector. November 15th, 11:30 a.m. - 1 p.m. at Miracosta College in Oceanside, CA. The Career Center's Law School Information Fair is Wednesday, November 2nd. Please stop by and meet with admissions directors if you’re interested in the law school process. There will be over 80 schools and test prep companies coming to the fair. The list of participating schools can be found at http://career.ucsd.edu/triton-fairs/lawfair.html There will also be a number of related events such as the LSAT Jeopardy offered by Kaplan and 2 admissions panels. Link2Downtown Tech provides students like you with the opportunity to engage with the growing tech sector in Downtown San Diego. Event is on Friday, November 4th from 12-5 p.m.
As a participant, you will be provided free roundtrip transportation to Downtown San Diego. On the tour, you will get behind the scenes tours with successful San Diego tech companies and get to see first hand the creative workspaces they have established for their employees. Academic Enrichment Programs is hosting an information session on how to apply to UC San Diego’s Undergraduate Research Scholarships (URS) and will mention other summer opportunities briefly. Do you have questions about Wi17 scheduling of classes? Come to CSSA Advising night on 11/2/16 from 5-6 p.m. in CSB 003 for answers. See you there! IBM is excited to invite you to attend our design thinking workshop, THINK You. This is an invitation-only learning opportunity to provide you useful insights about yourself and others who may be involved as you plan your career. Through this exercise, you'll also learn about the Design Thinking approach that IBMers use to deliver outcomes at speed and scale. After the workshop, you'll have the opportunity to meet IBM Recruiters for career related questions. Join us to learn more about the groundbreaking projects at IBM! What is Production Engineering and Software Engineering at Facebook and how do the roles complement one another? The Marcus Autism Center, in conjunction with the Emory University School of Medicine and Children’s Healthcare of Atlanta, is offering four fellowships: the Cohen Fellowship in Developmental Social Neuroscience, the Marcus Fellowship in Speech Science and Engineering, the Simons Fellowship in Computational Neuroscience, and the Simons Fellowship in Design Engineering. Students who will receive a bachelor’s degree by June 2017 will be eligible for the positions. The fellowships will commence in July 2017, and they are 2 years in duration. Students can find further details at: cohenfellowship.org and simonsfellowship.org. The Cognitive Science Graduate Students are hosting a panel for students interested in graduate school Thursday, October 20th, 6-7 p.m. in CSB 003. IBM Tech Talk: Transaction Networks 10/13/16 11 a.m. - 1 p.m.
We know you've all been anxious to get involved in the CogSci community so without further adieu... you are invited to our very first GBM of the 2016-2017 school year! Ever wanted to learn skills from outside your Major?? Want to work on a design project while doing so? Then this is the place for you. You are cordially invited to the COGS 109 Poster Session! Light refreshments will be provided. Drop-ins for a portion of the time are very welcome! Objective is to design a device or platform that improves the quality-of-life for senior citizens. Nick Bokaie, a native Petaluman who last year graduated with a degree in cognitive science from the University of California, San Diego, said he stumbled on the rally online soon after he’d finished school and decided there was “no better time” to take on the journey, which starts in London and ends in Russia, about 400 miles north of Mongolia’s capital. Come to the Undergraduate Honors Thesis Presentations on Friday 6/10/16 from 10:30 a.m. - 1 p.m. in CSB 180. Lunch will be served!!!! Three faculty members of the University of California San Diego have been elected to the American Academy of Arts and Sciences, one of the country’s most esteemed honorary societies and independent policy research centers. You're invited to Metamorphosis of the Mind National Cognitive Science Conference on Apr 10, 2016 at PC Ballroom West from 10 a.m. - 5:30 p.m. Successful applicants for the 2016 UC Human Rights Fellowship will receive $5,000 for summer internships with a human rights organization of his or her choice. Join the Cognitive Science Student Association as we proudly host the Annual National Cognitive Science Conference “Metamorphosis of the Mind” at UCSD on April 10, 2016. Are you an undergraduate interested in the Arts, Social Sciences, or Humanities? Then consider presenting your research at the UCSD Undergraduate Conference for Research in the Social Sciences, Arts, and Humanities (CRASSH) to be held on Friday, February 19 from 10 a.m. to 3:30 p.m. at the Institute of the Americas. Undergraduates interested in receiving research training in computational neuroscience are encouraged to apply to an NIH-sponsored summer program at the Center for the Neural Basis of Cognition in Pittsburgh. Undergraduates in their junior (3rd) year during the 2015-2016 academic year of baccalaureate studies interested in neuroscience, cognitive science, artificial intelligence, and biomedical science are invited to join the Center for Visual Science for a summer of supervised laboratory training. The Data Incubator is an intensive 8 week fellowship that prepares masters, PhDs, and postdocs in STEM and social science fields seeking industry careers as data scientists. The UC San Diego Institute for Public Health will host the 2nd Annual Public Health Research Day Symposium and Poster Session to highlight research accomplishments and real world Public Health activities of the UC San Diego Public Health community. Are you interested in a career in BlueTech? Come check out Link2BlueTech - where students like you are introduced to a panel of industry experts and given the opportunity to network and hear about exciting job opportunities within San Diego's BlueTech sector. November 15th 11:30 a.m. - 1 p.m. at Miracosta College in Oceanside, CA. Are you an undergraduate interested in the Arts, Social Sciences, or Humanities? Then consider presenting your research at the UCSD Undergraduate Conference for Research in the Social Sciences, Arts, and Humanities (CRASSH) to be held on Friday, February 19, 10 a.m. - 3:30 p.m. at the Institute of the Americas. The Psychology Department at the State University of New York, University at Buffalo (UB) is currently accepting applications for our Ph.D. program in Cognitive Psychology. CARTA is delighted to invite you to a special lecture by the renowned evolutionary biologist and longtime CARTA member, Dr. Francisco Ayala (UC Irvine). The UCSD Department of Literature is now accepting campus submissions for The Ina Coolbrith Memorial Poetry Prize! You are all welcome to our first Cognitive Science Student Association General Body Meeting of the year! We'll be meeting this Wednesday 10/7/15 at 6:30 p.m. at the PC West (Red Shoe Room). Opportunity to visit the MIT Media Lab! You're invited to the MIT Media Lab Open House for prospective students. PhD Candidate of Cognitive Science at UCSD, Mike Datko discusses the science of love and attraction at the Pint of Science Festival. Pint of Science is an international organization that aims to foster community interest in science through palatable presentations over a beer. UPDATE - Morning Session Added: Autodesk 3-D Workshop: 5/22/15 9-Noon AND 1-5 p.m.: Qualcomm Conference Room: Seating Limited-Register NOW! Friday, April 24th at 11 a.m.
"Every Number In Its Place: The Spatial Foundations Of Calculation And Conceptualization"
Congratulations to Marta Kutas. The Distinguished Career Contributions (DCC) award honors senior cognitive neuroscientists for their distinguished career, leadership and mentoring in the field of cognitive neuroscience. The recipient of this prize will give a lecture at our annual meeting. The prestigious fellowships honor early-career academics whose achievements and potential identify them as rising stars and the next generation of scientific leaders. Fellows receive $50,000 to further their research in eight areas: chemistry, computer science, economics, mathematics, computational and evolutionary molecular biology, neuroscience, ocean sciences, and physics. Impulse Journal, a premiere international undergraduate neuroscience research journal has set up a Review Site on the UCSD campus, and is currently recruiting students to participate on the editorial board. Come out to our recruitment meeting on Friday, Feb. 13th at 5 p.m. in the Guardian Office, located on the second floor of the Old Student Center, above the A.S. Lecture Notes. Free newspapers (and food) on attendance. Analyse & visualize local data sets to help solve social problems for $2,100 in prizes. The program is a ten-week undergraduate internship where students work collaboratively in interdisciplinary teams, receive core training, and gain hands-on research experience with emerging interface technologies. Interns accepted into this program receive on-campus housing and a meal plan, as well as a stipend. TODAY! Skyworks Info Sessions: Summer Internships! Wednesday 1/28/15 - 10 a.m., 1 p.m. and 4 p.m.
Now hiring summer interns (Electrical Engineering, CSE, Chemical Engineering, Environmental Engineering, Mechanical Engineering, Nanoengineering, and CogSci majors). Meet representatives and hear about paid internships! A team assembled by UCSD's Scott Makeig, wins $300K award for music-and-science initiative. The UC San Diego Strategic Planning process has identified four research themes to focus on as we build the student-centered, research-focused, service-oriented public university of the future. KPBS article: There's no escaping zombies. They've infected every corner of pop culture and more recently have been shambling into academia. Professor Bradley Voytek combines the living dead and neuroscience in the new book, "Do Zombies Dream of Undead Sheep?" Don Norman, an engineer and psychologist famous for pushing companies to develop products that are easy to use, is setting up a design lab at UC San Diego, a campus he left decades ago to help shape the future of Apple Computer. Learners in massive open online courses offered by Coursera can now enroll in 18 new Specializations – a targeted sequence of courses designed to build high-demand skills and subject matter expertise. One of the specializations – “Interaction Design” – is being led by University of California, San Diego Professor Scott Klemmer. BrainSCANr is designed to help neuroscientists choose research projects, a device by Bradley Voytek of the University of California, San Diego, and his wife Jessica. Are you an undergraduate interested in the Arts, Social Sciences, or Humanities? Then consider presenting your research at the UCSD Undergraduate Conference for Research in the Social Sciences, Arts, and Humanities (CRASSH) to be held on November 4 from 10 a.m. to 2 p.m. at the UCSD Price Center. The purpose of the Chancellor's Dissertation Medal is to recognize outstanding PhD research in one of six divisional areas. Andrea Chiba, associate professor of cognitive science, for “Socially Situated Neuroscience: Creating a Suite of Tools for Studying Sociality and Interoception.” “The “interoceptive” system is said to be a neural system that is critical to our physiological self-awareness and the feelings we share with others,” said Chiba.“This project aims to co-develop light, wireless, flexible recording sensors, an iRat (a robotic ‘animat’ with rat-like social behavior) and a set of experiments to interrogate the ‘interoceptive system’ by simultaneously examining physiological measures, neural activity and complex social behavior.” Primary researchers on the grant, in addition to Chiba, are Laleh Quinn, Todd Coleman and Marcelo Aguilar-Rivera of UC San Diego and Janet Wiles of the University of Queensland Australia. Former graduate student Ben Cipollini received a modeling award and $1000 prize at the 36th annual meeting of the Cognitive Science Society, for his work with Prof. Gary Cottrell on lateralization in visual processing. Slate story about Lera Boroditsky's research. The CSSA's 9th Annual Cognitive Science Conference is coming up! The conference is a day-long event, and attendance is free. It will take place on Friday, May 30 from 11 a.m.-4:30 p.m. in Price Center Ballroom East. San Diego's Union tribune interviewed the department's newest faculty member, Brad Voytek. Design.UCSD is a Student Design Competition hosted by UXSD (User Experience San Diego), a student-run design organization. This competition aims to engage students, with the support of industry and the university, in the design thinking process to tackle challenges that are familiar to them--the campus experience. The Cognitive Science Department is hosting an alumni reunion on May 3. (See: http://www.cogsci.ucsd.edu/alumni/alumni-reunion/) The reunion will include a poster session. Take advantage of this opportunity to show your research to other members of the past and current cognitive science community. Pump up the Code Jam, registration is open! Google's Code Jam competition brings the world's coding community together to solve algorithmic puzzles. Thermo Fisher Scientific Inc., the world leader in serving science, is pleased to announce the continuation of the Thermo Scientific Pierce Scholarship Program to help provide educational opportunities for future generations of scientists. In addition to investing in the world's future scientific endeavors, Thermo Fisher Scientific prides itself on our eco-friendly operations and products, along with working with customers, industry, and the scientific community to advance environmental management and science. Congrats to CogSci Honors Student Melody Kim! Interaction14 Conference Committee has chosen Cognitive Science Honors Student, Melody Kim, as one of five finalists for the 2014 IxDA Student Design Challenge chosen from over 70 applicants around the world. Join us as we listen to Alex Genov, Principal User Researcher, and UCSD Cognitive Science Alumni Jinny Wong, Interaction Designer, talk about design and research at Active Network. One to two-year scholarships will be awarded. Deadline: Monday, Feb. 3, 11:30 p.m. The online UCSD Scholarship Application is now available via TritonLink. The Yale Fellowship in Developmental and Computational Social Neuroscience will select highly qualified college graduates to participate in cutting-edge clinical, developmental, and computational research on social cognition in infants at risk for autism as well as toddlers affected by developmental disabilities at the Yale Child Study Center. The Yale Child Study Center is a leading institution for research on autism and related social disabilities, with a multidisciplinary approach to autism research spanning projects in behavioral neuroscience, neuroimaging, molecular and population genetics, and treatment. Successful applicants will be involved in a two-year program of training involving clinical and research experiences, commencing on or before July 1, 2014. The Marcus Autism Center, in conjunction with the Emory University School of Medicine and Children’s Healthcare of Atlanta, is offering three fellowships: the Simons Fellowship in Computational Neuroscience, the Simons Fellowship in Design Engineering, and the Cohen Fellowship in Developmental Social Neuroscience. Undergraduates interested in receiving research training in computational neuroscience are encouraged to apply to an NIH-sponsored summer program at the Center for the Neural Basis of Cognition in Pittsburgh. The Center for the Neural Basis of Cognition is a joint interdisciplinary program of Carnegie Mellon University and the University of Pittsburgh. The 2014 program will *tentatively* run from May 27 through August 1, 2014. The final deadline for application is Feb 11. All participants must be United States citizens or permanent residents, must be enrolled at a 4-year accredited institution, and must be in their sophomore or junior year at the time of application. Any undergraduate may apply, but we are especially interested in attracting students with strong quantitative backgrounds with some experience in calculus, statistics and/or computer programming. Experience in neuroscience is not required. Students from groups underrepresented in the sciences are encouraged to apply. Is it possible to teach classes with creative, open-ended projects on a massive scale? MARCS invites applications from highly motivated graduates seeking to undertake a PhD as part of an ARC Linkage Project on Distributed Cognition and Dynamic Memory in Australian Dance Theatre. This interdisciplinary PhD project, under the supervision of Prof Kate Stevens, will use theory and experimental methods from cognitive science to investigate long-term memory for contemporary dance. The larger ARC project involves collaboration with researchers at UWS, Deakin University, and the Australian Dance Theatre (Adelaide). A UC San Diego team wants to bring higher learning to billions who have no access. If you’re interested in getting a job in a design-related field (i.e. Cog Sci, HCI, UbiComp, User Experience, Interaction Design, UX Research), definitely come out to UXSD's (User Experience San Diego) Hiring Panel event on Tuesday, November 12th. We're going to have designers, recruiters, and freelancers from a variety of companies and backgrounds talk on a panel about how to get hired, how to stand out in a pool of applicants, workplace diversity, and how to excel once you've gotten the job. Free t-shirts if you ask questions, pizza so you don't go hungry, and lots of swag/hiring information. Society for Neuroscience is in San Diego this year, and it’s time to celebrate that wonderful fact with free Mexican food. Come meet the peer-review team for the Impulse Neuroscience Journal from 12 p.m. to 2 p.m. on Thursday, November 7 and network with other students and faculty who will be attending the conference. Scholarpedia provides a way for scientists to communicate broad ideas and concepts, a "Wikipedia for scientific peers." Are you an undergraduate working on a research project in the Arts, Social Sciences, or Humanities? Then consider presenting your project at the Undergraduate Conference for Research in the Social Sciences, Arts, and Humanities (CRASSH) to be held on November 20 from 10 a.m. to 2 p.m. at the UCSD Price Center. WEBROOT Internet Security Job Opportunity! Come meet Webroot's San Diego team October 21st 2013! Learn more about what we do and how we're revolutionizing internet security. Speak with our senior engineers, get your resumes reviewed, and even have immediate on-site interviews! Ewen Callaway meets cognitive scientist David Kirsh, who works with choreographer Wayne McGregor. The TMC/CREATE School Partnership Program is seeking volunteers to serve in classroom and non-classroom positions at two partner school sites: The Preuss School UCSD (http://preuss.ucsd.edu/) and Gompers Preparatory Academy (http://gompersprep.org/). Applications are due this Friday, October 4th! Get ahead this academic year by attending the Cognitive Science Student Association's opportunity-focused events! Interested in SCIENCE EDUCATION? Looking for some great VOLUNTEERING opportunities? Want to build valuable TEAMWORK and PUBLIC SPEAKING skills? Check out Interaxon, UCSD's own neuroscience education outreach org! Come to "A Mindful Approach to the BRAIN Initiative" hearing. The hearing will focus on how the State of California can step up to meet the challenges and opportunities of the Brain Research through Advancing Innovative Neurotechnologies (“BRAIN”) Initiative. On behalf of Stanford University's Center for Compassion and Altruism Research and Education (CCARE), we write to invite the students of your organization to participate in and attend our upcoming Compassion and Technology Conference and Contest at Stanford University on December 6, 2013. Education Abroad Program (EAP) Spring 2014 Application Deadlines Extended! Want to study abroad with EAP during the spring of 2014?! It’s not too late to apply! UCSD has awarded tenure to Angela Yu. We congratulate her for this great achievement and look forward to her continued success. Join us in the offline learning revolution, and help to bridge the digital divide! The Foundation for Learning Equality (FLE) is a non-profit organization dedicated to creating tools for sharing and authoring open-licensed educational content for use by anyone around the world, with a focus on reaching those with limited or no internet access. We're looking for software development interns to volunteer with us this summer to help expand the KA Lite project, a lightweight web app for serving core Khan Academy content (videos and exercises) without needing internet connectivity, from a local server (even a Raspberry Pi!). The internship will take place around the UCSD campus, but can also be done remotely (we have developers around the world). Please read the application overview for more information, and feel free to email us at info@learningequality.org if you have any questions. Are you looking for project experience? Are you interested in revolutionizing medical technology? The Balboa Park Cultural Partnership invites you to participate in the NSF-funded Art of Science Learning Incubator for Innovation. The Art of Science Learning project uses the arts to spark creativity in science learning and to develop a skilled workforce in STEM (Science, Technology, Engineering, and Mathematics). Prof. R. Núñez's & Dr. K. Cooperider's article 'The tangle of space and time in human cognition' is on the cover of the current (May) issue of Trends in Cognitive Science. The annual Undergraduate Library Research Prize is co-sponsored by the UC San Diego Libraries, the Vice Chancellor of Student Affairs, and UC San Diego Alumni Association. The prize is offered to undergraduate students who have strategically and effectively used UCSD library resources in direct support of research undertaken on campus. Want to Learn “R” for Free? Feel like ripping your hair out while dealing with data in Ecel or SPSS? Want to avoid paying for MatLab and still be able to process vast amounts of data? R is one of the most powerful programming languages available for scientists! The Cognitive Science Student Association cordially invites you and your colleagues to the fifth annual California Cognitive Science Conference on May 4th 2013, at the beautiful UC Berkeley campus. This year, we are excited to explore “Learning and Memory: The Enlightened Mind,” through the lens of Artificial Intelligence, Developmental Psychology, Neurobiology, Cognitive Linguistics, Education, and Philosophy of Mind. Cognitive Science students help develop app to bring online content to those without Internet access. The self-described “tinkerers” and “hacker-ninjas” behind a free web app they call “KA Lite” have an immodest goal: They aim to bring the revolution in online education to the 65 percent of the world that isn’t online. ASSC17 – The 17th annual meeting of the Association for the Scientific Study of Consciousness – will take place in San Diego, USA, from July 12-15, 2013. ASSC 17 is intended to promote interdisciplinary dialogue in the scientific study of consciousness. ASSC members as well as non-members are encouraged to submit contributions that address current empirical and theoretical issues in the study of consciousness, from the perspectives of neuroscience, psychology, medicine, philosophy, computer science, and cognitive ethology. Mitchell has Internship opportunities for students working towards undergraduate and graduate degrees, as well as recent technical and business graduates. The Toddler Developmental Disabilities Clinic at the Yale Child Study Center in the Yale School of Medicine is interested in recruiting highly qualified students from UCSD for an exciting new pre-doctoral fellowship for current graduates or graduating seniors. The position will commence June 2013 and will be 2 years in duration. Save the date: The 8th Annual Cognitive Science Conference will be held in the spring quarter, on April 7th in the West Ballroom of Price Center. More information about this awesome event will be announced soon! UCSD Cog Sci team launches offline version of Khan Academy, "KA Lite"
We're currently experiencing what we're calling an "online learning revolution" — but what about the 65% of the world that can't take advantage of it? KA Lite is a lightweight web app for serving core Khan Academy content (videos and exercises) without needing internet connectivity, from a local server. Volunteer Opportunities at UCSD Partnership Schools! The TMC/CREATE School Partnership Program is seeking volunteers to serve in classroom and non-classroom positions at two partner school sites: The Preuss School UCSD and Gompers Preparatory Academy. Volunteers support students in grades 6-12 at high-needs charter schools, where educators are utilizing innovative and effective methods of shaping positive outcomes for low-income, first-generation college-bound youth. Professor Ben Bergen discusses his research on how language works in the brain. UNCF/Merck offers scholarships and fellowships for African Americans in the biological, chemical, and engineering sciences. Undergraduate scholarships offer up to $25,000. Graduate Dissertation Fellowships offer up to $53,500. Postdoctoral fellowships offer up to $92,000. A series presented by UCSD Alumni and the Division of Social Sciences, What I’ve Learned from Life, Work and UCSDwill spotlight two social sciences alumni, Marty Adelstein ’82 and Chris Ottinger ’90. From students who majored in political science to executives in the entertainment industry producing Teen Wolf on MTV, Adelstein and Ottinger both have interesting stories to tell about their experiences at UC San Diego and trajectories to success in business and life. Previously sponsored by the Yale University School of Medicine, the Donald J. Cohen Fellowship in Developmental Social Neuroscience will select highly qualified college graduates to participate in cutting-edge clinical research on social cognition in infants at risk for autism at the Marcus Autism Center. Previously sponsored by the Yale University School of Medicine, the Simons Fellowship in Computational Neuroscience will select highly qualified college graduates to participate in cutting-edge autism research at the Marcus Autism Center. Previously sponsored by the Yale University School of Medicine, the Simons Fellowship in Design Engineering will select highly qualified college graduates to participate in cutting-edge autism research at the Marcus Autism Center. Come and find out about career with Samsung!!! The first event coming up is a Cogsci Class Q&A and Textbook Exchange on Thursday, Oct. 4, from 5-7 p.m. in CSB 114. This meetup is for anyone who wants to find out if they’re taking the right cogsci classes and for those who want to buy/sell textbooks for those classes. "Group led by two Cognitive Science faculty members discovers 'biological clock' in brain imaging study of developing children"
It is our dear hope that you are both aware your research, teaching, and mentorship at the Distributed Cognition and HCI Laboratory has had an enormous impact. As former students, we take great pride in being counted among those who benefited from your tutelage. With our most sincere gratitude, it is our pleasure to make this joint gift to your lab. These funds are unrestricted and are to be used at your discretion to support your work. As Cognitive Science alumni (in Ryan's case) and recipients of your guidance and advisement (in Nate's case), it's important to us to give back to the institution and instructors who gave us our joy for understanding minds in the wild. We look forward to watching you inspire another generation of young practitioners, and to your continued advancement of the field. Congratulations to our new full profs!!! "Making Sense of Space: Sculpture, Mind and Human Imagination"
The ECE Department and Rady School of Management invite you to participate in the ECE Design Competition. Come to the 7th Annual Cognitive Science Conference: Journey Into Cognitive Science on Saturday 4/14/12 from 9 a.m. - 4 p.m. in UCSD Solis Hall. The Temporal Dynamics of Learning Center at UCSD has 12+ spots for next year's undergraduate research training program. Google Android Camp 2012 Accepting Applications - Freshmen and Sophomores Apply Today! Are you a freshman or sophomore interested in Android development? Would you like to join us for an all-expenses-paid program of interactive and collaborative Android curriculum at our Mountain View headquarters this summer? Apply for Android Camp today! Celebrated conceptual artist and CalArts Professor Charles Gaines engages in a conversation with Dr. Rafael Nunez, Associate Professor of Cognitive Science at UC San Diego. Wednesday, February 15, 2012 - 6:30 p.m.
Be a Calit2 paid student researcher this summer! This grant is part of a project funded by the National Science Foundation (NSF grant DUE-0942497) that provides free access to educational tools in cognitive neuroscience. The goCognitive website hosts interviews with well-known researchers in cognitive neuroscience as part of its video archive. The Indiana Undergraduate Journal of Cognitive Science is seeking submissions for the seventh volume of its online scholarly publication. Internship Open House with Quake Global, Inc.
Join us for an info-session, lunch, and facility tour! 2012 California Strawberry Scholarships applications available! Scholarships available exclusively for children of strawberry farmworkers! We are now accepting 2012-2013 California Strawberry Scholarships applications. The Institute for International, Comparative, and Area Studies (IICAS) at UC San Diego is pleased to announce a competition for 2012-13 Undergraduate Student Research Travel Grants to support senior honors thesis research by undergraduates in international, comparative, and area studies. Thinking about studying abroad to the United Kingdom or Ireland? Learn more about the UK/Ireland program opportunities at the United Kingdom/Ireland Info Session on Thursday, January 26 from 1 p.m. to 2 p.m. in the International Center Lounge. The Toddler Developmental Disabilities Clinic at the Yale Child Study Center in the Yale School of Medicine is interested in recruiting highly qualified students from the University of California, San Diego for an exciting new pre-doctoral fellowship for current graduates or graduating seniors. The position will commence June 2012 and will be 2 years in duration. AT&T San Diego Apps Challenge! $50K in prizes! Scholarship information available to UCSD students. Sometimes these go unclaimed for lack of applications. Take a look and see if you are eligible. The Centre for Vision Research (CVR) at York University offers a one-week, all-expenses-paid undergraduate summer school on vision science. Google is proud to announce the 2012 Google Anita Borg Memorial Scholarship, awarding a group of female students each a $10,000 scholarship for the 2012-2013 academic year. The Department of Cognitive Science (http://cogsci.ucsd.edu) within the Division of Social Sciences at the University of California, San Diego is committed to academic excellence and diversity within the faculty, staff, and student body. The department invites applications for a new faculty position in human-computer interaction. The department has a preference for a senior researcher to be appointed at the associate or full professor level, but will also consider junior candidates. Appointment begins July 1, 2012. The Human Computer Interaction Graduate Program at Iowa State University hosts a summer Undergraduate Research Experience, sponsored by the National Science Foundation. Housing and meals are provided, as well as a $5000 stipend. See our list of posters & presentations at SfN, this year in San Diego! Whether it's news depends on what you know. But, newsworthy, without a doubt! Anne Marie Piper presented a paper, "Introducing Multimodal Paper-Digital Interfaces for Speech-Language Therapy", at the 12th International Conference on Computers and Accessibility (ACM ASSETS 2010). She received a Best Paper award. Cognitive Science is in part the people who do it. Get to know one such UCSD Cognitive Scientist -- Seana Coulson -- as she talks about her laboratory's research into how brains construct meaning. From her mind to yours, thoughts on cognitive semantics, humor, gesture, and her book in progress. On Nov. 9, PBS’ Frontline premiered a highly anticipated new episode on false confessions and the case of the Norfolk Four, who were wrongfully convicted of a 1997 murder in Virginia based on false confessions given after hours of police interrogation. Go to website if you missed it. CHECK IT OUT @ http://sianbeilock.com/ or Amazon! The book is aimed at a broad audience and uses science (her research and many other people's work), stories, and interesting facts to shed light on why people often fail to perform their best when the stakes are high - in academics, athletics, and the business world - and what can be done to ensure success when the pressure is on. Douglas Sperber has over 16 years of experience in the Information Technology (IT) industry and has provided senior IT consulting services for Fortune 500 companies. He started InSynergy, LLC. and has grown the firm to include over 50 consultants. Through his vision and management, InSynergy, LLC. continues to provide value, integrity, and professionalism in delivering the finest technical services. We are pleased to announce the rebirth of the Wa, our informal departmental talk series! Starting this Fall, the Wa will meet Mondays at 12 noon for an hour of impassioned intellectual camaraderie. Talks will range from informal brown-bag discussions to well-advertised Colloquium Talks. Speakers may present talks they've already delivered elsewhere, practice talks for upcoming conferences, in-progress studies in need of feedback, or off-the-wall theoretical proposals. All are encouraged to speak: faculty, visiting scholars, post-docs, and graduate students. To get things started, we will meet biweekly in the Fall quarter. The first Wa speaker will be Prof. Ed Hutchins, on Monday, October 11, 12-1 p.m., in CSB 180. Let's pack the room, and have a vigorous discussion! The Wa will meet every other week after the 11th, with talks by Prof. Sarah Creel, Prof. Rafael Núñez, and Leo Trottier. Congratulations to Ben Cipollini for receiving a CARTA graduate fellowship in Anthropogeny! Congratulations to Ben Cipollini, our first student in the CARTA specialization, who recently received a graduate fellowship in Anthropogeny. If you're interested to learn more about CARTA, contact Ben or attend the next symposium. UC San Diego: There’s an App for That! The University of California, San Diego, the first public university to create its own iPhone application, is now one of the first universities to launch a new application for alumni. In the tradition of UC San Diego innovators who have been on the cutting-edge of broadband wired and wireless Internet connectivity for years, the UCSD Alumni Association’s new application allows alumni around the world to maintain their campus connection. Seana Coulson, who studies language, received funding to study how gestures are used in communication. Coulson will measure volunteers' brain activity while they watch videos of people talking about the size and shape of objects to see whether they respond more when gestures are used. Congratulations to Jake Feldman, Brendan Jonesrebandt and Nastasha Tan for their well deserved honors in Cognitive Science! Good luck to the Cogsci major class of 2010! Congratulations to this year's recipients of the departmental TA/IA teaching awards! Distinguished Professor Marta Kutas has received an honorary degree from Radboud University, Nijmegen (in association with the Max Planck Institute for Psycholinguistics and the Donders Institute for Brain, Cognition, and Behavior). CSSA is having a BONFIRE (with free food) this SATURDAY (May 22) at LA JOLLA SHORES at 6:30 p.m.! Congratulations to Leo Trottier, whom the UCSD Friends of the International Center have selected to receive the Friends Ruth Newmark Scholarship. QAMA: The Calculator That Thinks Only If You Think Too! Calit2-affiliated inventor Ilan Samson has developed a calculator that requires the user to make a reasonable estimate before getting an answer. Professor Joan Stiles' new book, "The Fundamentals of Brain Development" has been selected as the Cognitive Development Society Book of the Year. The award will be announced at the biennial meeting October 16-17 in San Antonio. Contgratulations Prof Stiles! "Wayne's world: when ballet met science ... "
Britain's foremost choreographer Wayne McGregor teams up with US scientists to discover the theory of creativity. Cognitive Science PhD alumna, Alexandra Horowitz has published a new book on dog cognition: Inside of a Dog. Are you interested in the inner workings of the mind or intelligent systems? Do you have a paper that deals with anything related to this complex subject? If so, then consider submitting it for PUBLICATION in a peer-reviewed journal! The IUJCS is a peer-reviewed, online journal of writing in cognitive science. The journal is currently accepting submissions of original work by undergraduate students in cognitive science and related disciplines. Submissions may originate from any field within cognitive science including, but not limited to: artificial intelligence, anthropology, biology, computer science, linguistics, logic, philosophy, psychology, and neuroscience. Even if you are unsure whether your work is relevant, I encourage you to submit. *Building your publication record for graduate school or employment, and much more. The deadline for all submissions for the Summer 2009 edition of the journal is September 30, 2009. The outstanding CogSci TAs and IAs for 2008-2009 have been named. Congratulations to all! The Committee on Distinguished Teaching has selected Professor Christine Johnson as a recipient of the 2009 Barbara D. and Paul J. Saltman Distinguished Teaching Award for Non-Senate Members for her "outstanding contribution to teaching". Professor Johnson will receive the award at the Awards Reception on Friday, May 29th 2009. "Collaboration and communication in children and chimpanzees". "Cognitive scientists seek to quantify body movement"
Cognitive Science Professor David Kirsh will "observe how [Wayne McGregor / Random Dance] develop a vocabulary of movement" using video and interviews. What makes Apple so different? Cognitive Science Professor Don Norman says Apple products have "emotional design". "Test Subjects Who Call the Scientist Mom or Dad"
Cognitive Science Professor Gedeon Deak and other scientists discuss the pros and cons of using your own children as research subjects in a New York Times Article. "In Search of the Just-Right Desk"
Professor David Kirsh describes some principles that make up the best desk in this New York Times article. CogSci undergraduate senior selected for 2009 CRA Honorable Mention! A hearty congratulations to Anna Ostberg, 2008-2009 undergraduate honors program student with Dr. Jim Hollan, who has been selected for Honorable Mention in the Computing Research Association's Outstanding Undergraduate Award competition for 2009. CogSci graduate wins library award for research! Jacqueline Acuna, Cognitive Science Honors BA, 2008, is one of 4 students to be awarded the 2008 Undergraduate Library Research Prize for their outstanding research skills. Professor David Kirsh in CNN Fortune article. Cog Sci in the News! Our own Professor David Kirsh is quoted in the San Diego Union-Tribute article "Crammed TV screens a strain on the brain?". Cognitive Science emeritus professor Aaron Cicourel has received an honorary doctorate from the Complutense University of Madrid. Congratulations to Professor Rafael Núñez who has been awarded a prestigious fellowship from the Institute for Advanced Study in Berlin for 2009. CogSci Researchers receive 1 of 26 NSF Grants! Cognitive Science Professors Jim Hollan and Ed Hutchins, along with UCSD colleague Javier Movellan have been awarded 1 of 26 NSF grants. UCSD researchers F. Tanaka, J. Movellan, and CogSci emeritus A. Cicourel publish article "Socialization between toddlers and robots at an early childhood education center" in the Proceedings of the National Academy of Sciences. The Jack Kent Cooke Foundation has awarded recent UCSD graduate, Joachim Lyon, a full scholarship for up to 6 years which could total $300,000. Cognitive Science professor emeritus Jean Mandler has been selected to receive a Best Authored Book Award from the Cognitive Development Society. Her outstanding volume, "The foundations of mind: Origins of conceptual thought" will be recognized during the opening ceremonies of the meeting of the Society in Sante Fe, New Mexico, October 26-27 (2007). Cognitive Science professor emeritus Jean Mandler has been selected as a recipient of the 2007 American Psychological Association (APA) Distinguished Scientific Contribution Award. As the history of this award indicates, it is an outstanding accolade for scientific achievement. An announcement of all APA award recipients will be printed in the March 2007 APA Monitor. Time plays an important factor in learning. But how? At what level? These kinds of questions, and many others, will be addressed by the scientists who are part of a new "Science of Learning" center based at UC San Diego that has just been funded by the National Science Foundation (NSF). Jeff Elman, a distinguished professor in our own department of Cognitive Science here at UCSD, has been been named the 2007 recipient of the David E. Rumelhart Prize. Elman is the seventh winner of the annual award which is given for outstanding contributions to the foundations of cognitive science.